New Yorkers have been pouring into the city’s homeless shelters throughout 2014, bringing the number of homeless people to a new record high: 58,913. Thank You For Bringing Holiday Cheer! 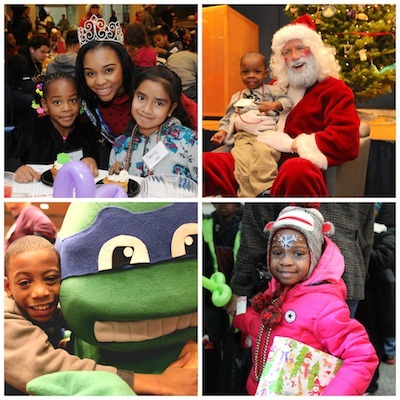 On Saturday, December 13th more than 125 girls and boys from nine different New York City homeless shelters joined the Coalition for the Homeless for our annual Holiday Carnival. The children were greeted with activities, treats and gift bags full of small toys to get them started. After feasting on a delicious lunch, the kids played carnival games, got their faces and nails painted, played with arts and crafts, and enjoyed singing and dancing with characters from Disney’s Frozen. The highlight of the day was a special visit from Santa, who made sure each girl and boy left with arms full of brand new toys, a gift for a parent or loved one – and of course a huge smile on his or her face. We are so grateful to all who donated toys, funds and their time to make this incredible day a reality, and would especially like to recognize the generosity of our hosts, the United Federation of Teachers, as well as AIG, Edelman, FGI, Random House, Societe General, and Christy Burke and Friends! With more than 25,000 children in homeless shelters tonight, the Coalition still had more winter wishes to fill. As our drive wrapped up last week, bags were filled to the brim with dolls, Hot Wheels, scooters and everything in between. Thanks to our supporters, we have already been able to deliver more than 5,000 gifts directly to shelters – and more are still coming in! The holidays are truly about giving, the anticipation of what is to come and the welcoming of a new year with all its possibilities. Although those things cannot be bought or wrapped up, for a child receiving an unexpected gift, a new toy of his or her very own can be a glimmer of hope for a better and bright New Year. Several nights a week Juan De La Cruz travels the city to help feed New York’s homeless.